Learn About Candidates for the Portland Public Schools Board! Click on the arrow on the picture of the video recording in the post above this one to view the April 11 forum. 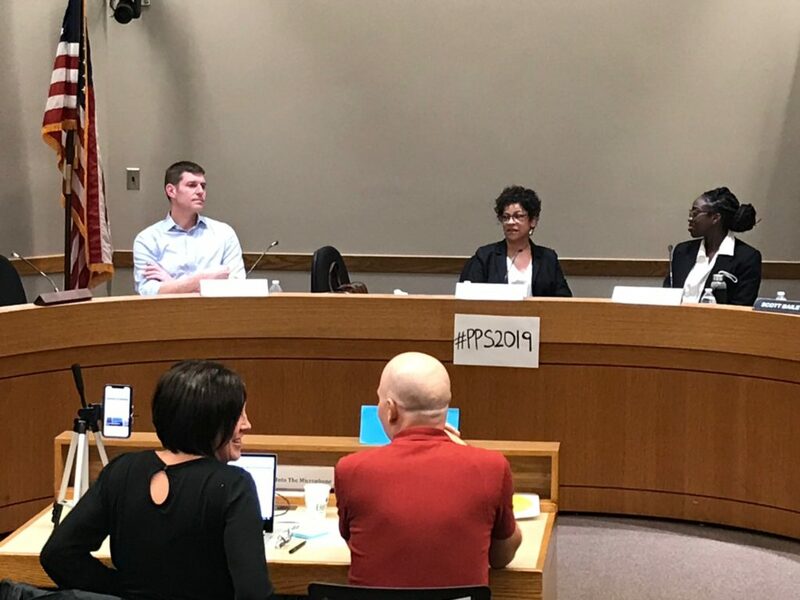 The recording of the forum features the candidates who are running for the PPS School Board in the May 21, 2019 Special District Election. You can listen as the candidates answer probing questions, so you can decide which candidates should help shape public school policies in the next four years. The forum was sponsored by the League of Women Voters of Portland Education Fund, Portland Council PTA, and The Bus Project. VOTE411.org is the nonpartisan LWV website with information on the candidates that will be on your ballot for this May 21, 2019 Special District Election. (It includes board candidates for all school districts in Multnomah County, community colleges, and the Multnomah Education Services District). The Voters’ Guide is available in print now. You can also read a copy online by clicking School Board Election Voters’ Guide. 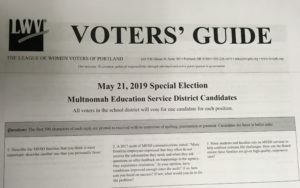 It includes answers to questions by candidates for this May 21, 2019 Special District election, including board candidates for all school districts in Multnomah County, community colleges, and the Multnomah Education Services District. Printed copies will be available soon at Multnomah County Library branches, and the Multnomah County Elections office. We thank the funders for these voter service activities: the Wyss Foundation, the Carol & Velma Saling Foundation, the Sara Frewing Fund, the Multnomah Bar Foundation, and the League of Women Voters of Portland Education Fund.